One of the articles I’ve circulated over the years is an article about the power of thank-you notes. One subscriber, Duncan Shaw, recently sent me an email relating how this article had impacted his business. In recent years I have observed an increasing reliance on auto-responders, aWeber tools and other means for small business owners and marketers to try to leverage their time. This is all well and fine, but this “insert peg in hole” culture has fostered an impersonal and homogeneous experience for both clients and prospective clients. And then we wonder why our professional service businesses are treated like price-driven commodities? Hmm. Even with vendors I work with only occasionally, I can smell a template email response a mile away, and it makes me think: What, I’m not important enough that you couldn’t find 20 seconds to send me a personal email reply? Anyway, with this in context, the article thank-you note writing hit a nerve (in a good way) and it made me think: Who does this today? Hardly anyone, of course. I can count on one hand the number of times I’ve received a short, thoughtful, hand-written note from someone–but I can also remember who they were and what their business is, to this day. And people forget about the life-time value of a client’s business, not just their first year or two’s worth of invoices. So what does this say about that? About two months ago I started sending 2-3 short notes daily to vendors, clients, contractors, colleagues, anyone I came into contact with, however minor the occasion. It’s important to “smile as you write”, as your article suggests, otherwise it will seem like some contrived, dashed off attempt at connecting while trying to do 20 other things at the same time. 1) In a very unexpected way, it has made me feel better about myself and my business as a service provider, which bleeds through into the energy I exude all day long. To anyone who doesn’t think it makes a difference in how you walk, talk, and carry yourself and your expressions, I would say try this for yourself and see. I also find myself following through with clients more thoroughly and attentively, and having better focus and productivity. I think it has something to do with taking a few minutes to *slow down* and give someone your undivided attention. We all crave feeling listened to and acknowledged. 2) On a more tangible level, I have had two important corporate referrals and increased amounts of business from regular clients to whom I’ve dropped notes in the mail (one of them nearly double). I have also received expressions of true, bona fide human appreciation from both clients and vendors we work with, who really will go the extra mile now. Little human touches in the impersonal “we care, but not that much” ocean has an exponential effect on people’s desire to know, like, trust, and do business with you. It simply cements your relationships and builds trust and goodwill. I want to be clear that while I have become a believer in sending hand-written notes, the object is NOT to simply garner new business or manipulate vendors into putting forth additional efforts; if that’s someone’s thinking, it will be very apparent and backfire. The object should be just in doing it itself without expectation of reward or recognition, and let things take care of themselves. Hope this is of some interest/help; I’m grateful for your work and mission. Having been through the Dan Kennedy’s and Jeff Paul’s of the world of marketing in earlier years (who know their stuff insofar as making money, certainly), your services and information products ARE unique and invaluable. Taking the extra step to make sincere contact with your customers gives multiple rewards. 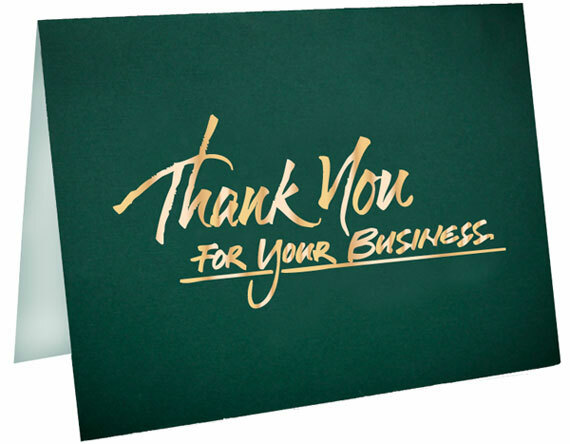 Write a note today expressing your appreciation. As Duncan said, you’ll also feel better about yourself in the process!